In the 1990s, England, a chronometer issued in 1848 by the Greenwich Observatory to the British Royal Navy, and this to a naval officer aboard a renowned Arctic expedition whose members vanished, was found in good condition without traces of ever having been exposed to the extreme forces at work at the top of the world. Did it suggest a sinister conspiracy or even murder? In modern day Canada’s Northern Territory, a drifter named Nelson is puzzled by the apparent disappearance of his look-alike brother, who was investigating the fate of Polar explorers, the identity of an outlaw, and the role of secret spies, using government archives and local sources. Nelson teams up with Fay, a stranded tourist with burning questions about her late grandfather, to search for clues about his brother’s whereabouts and the subjects of his obsession. 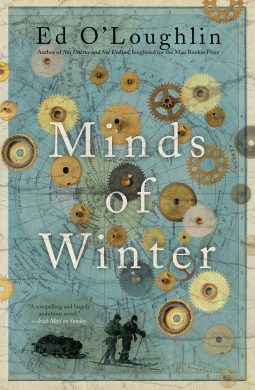 Minds of Winter is an ambitious novel, sweeping in scope, about the golden age of Polar scientific exploration and the motivations behind the men who conquered the lands of everlasting winter. It also provides a historical backdrop to delve into the inner lives of some of the most renowned explorers, such as Roald Amundsen, Sir John Franklin, and Cecil Meares. Minds of Winter is 500 pages long and it reads like a literary page-turner, but some passages could have been tighter edited as I think they contribute little to the central mystery. I felt that was particularly the case with the character Hugh Morgan, whose employer and purpose remained obscure until the end. The novel is comprised of nine parts (or long chapters), each one unraveling the mystery of the men whose names were forever immortalized when geographical features in polar latitudes were named after them. Each of those mysteries ties into a few central threads, such as the fate of the chronometer and how it may have reemerged undamaged. The novel is very well developed and kept me guessing until the final page, though some mysteries I could work out on my own from the clues planted by the author throughout. My only criticism is regarding the ending, which left me with unanswered questions that I would like to discuss further. I've always found the exploration of the Arctic and Antarctic to be interesting subjects. Based on your review, it sounds as though this author does full justice to those who engage in those explorations. It was an engrossing read. I found it while browsing the Netgalley titles available for request. The title and the genre spoke to me as did the book description. I think I would save this to read in the fall when it is always in the triple digits here. I am tired of being cold! But it sounds fascinating! I think this sounds fascinating. To be honest, I probably won't pick it up at the moment although you never know - I do like the sound of it - even if it could be tightened a little. There were relevant parts that, I felt, did not contribute to the overall resolution of the story, but it was a strong four novel. This book seems up my alley since I've read many of the Polar explorers' books. Is this one mostly about Franklin or is it about various explorers? I'm curious about it, thanks. Franklin is how it starts, but it follows different Polar expeditions up to after WWII.